Fact: The United States, where only 8 percent of births are attended by midwives, consistently ranks at or near the top among developed countries in rate of infant mortality during childbirth. The Netherlands and the United Kingdom, where nearly seventy percent of all births attended by midwives, rank much further down the list. Prompted by those and other striking statistics, as well as by their own difficult and disappointing experiences with childbirth, the actress Ricki Lake and documentary film director Abby Epstein set out nearly a decade ago to understand why, for the most part, midwives have been left out of the birthing process in the United States. The result was their 2007 documentary film, “The Business of Being Born,” which was shown in Milbank Chapel this past spring with its two creators on hand for subsequent discussion. 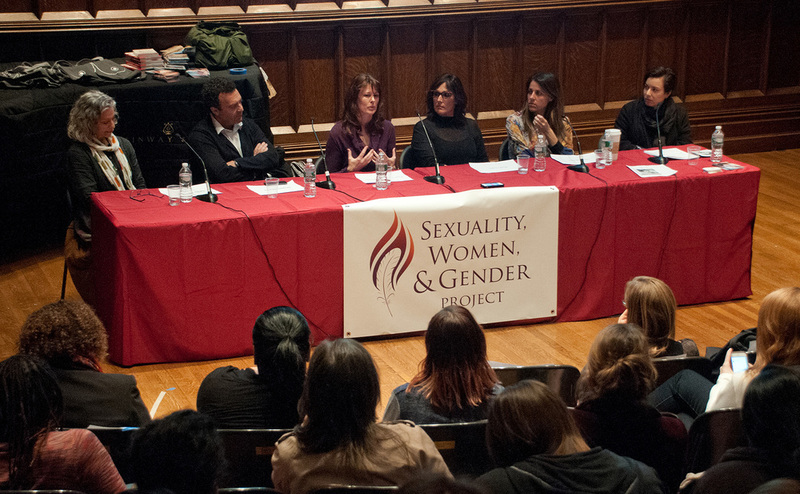 The event, organized by Clinical Psychology master’s degree student Liz Murray, was hosted by TC’s Sexuality, Women, and Gender Project and moderated by Aurélie Athan, a faculty member in the College’s Department of Clinical and Counseling Psychology. 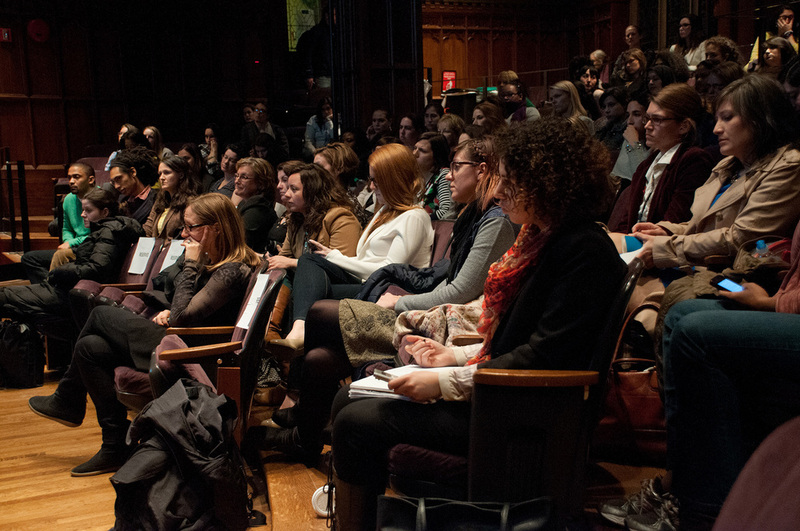 “I wanted to bring ‘The Business of Being Born’ to Teachers College to help open the conversation of women's bodies as capable,” said Murray, who is the author of Breaking Night, the story of her journey from homelessness to the Ivy League. Through interviews with couples, midwives and doctors, the film takes viewers on a journey uncovering the history of midwifery and its eventual disappearance from the American medical profession in the 1930s. We learn that in many U.S. hospital births today, the natural hormone oxytocin is replaced with a synthetic form, Pitocin, to induce labor contractions. Women who exceed the expected time in labor are often pressured to take Pitocin, beginning a pendulum of medications, epidurals and more Pitocin. While assisting labor, these drugs can also heighten fetal distress, which may require an immediate intervention such as a Caesarean section. Although C-section surgeries remain an essential procedure for complicated births, they are now employed in nearly 45 percent of all births in New York City. The 20-minute surgery has also become the preferred process to vaginal births in many hospitals across the United States. In contrast, research shows that the use of doulas – birthing coaches – decreases epidural rates by 50 percent and C-Section rates by 28 percent. Why does our society choose to “medicalize” an event that, when it goes as it should, has nothing to do with illness? One answer, argue Lake and Epstein, is that obstetricians view midwives offering low-cost services as an economic threat. Another is that strict liability legislation compels physicians to take as much control of the birth as possible, usually through medications and surgical procedures. 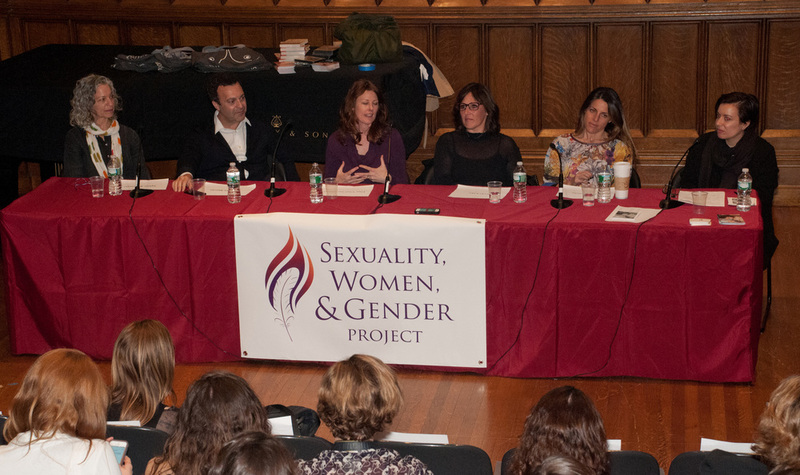 After the screening, the filmmakers led a panel discussion that included Jacques Moritz, an OB/GYN at St. Luke’s-Roosevelt Hospital Center and Assistant Clinical Professor of Obstetrics and Gynecology at the Columbia University College of Physicians and Surgeons; Élan Vital McAllister, founding President of Choices in Childbirth; and Sylvie Blaustein, founder of Midwifery in Manhattan. Moritz noted that medical residents mainly witness birth by C-section rather than natural births. He and Blaustein discussed the importance of having doctors and midwives work together to create healthier birth outcomes. Ideally, women could opt for natural births assisted by midwives with whom they have developed a trusting relationship during pregnancy. Physicians would be available in case of emergency. The panel also discussed that one major challenge to homebirths in New York City is the lack of available hospital transfers. With 38 hospitals in New York City providing maternity care, none actually accept homebirth transfers. In fact, the only hospital welcoming to homebirth transfers is located in Long Island, where some midwives are granted privileges allowing them to transfer their clients. Dr. Moritz also stressed the importance of careful planning in homebirths, which includes seeking prior agreements with a physician or hospital in case of an emergency transfer. It seems clear that there is a growing demand for this model. In the past five years, the rate for homebirths has increased by 50 percent nationally, and by 70 percent in New York City alone. Yet according to McAllister, the increased demand for homebirths in New York City remains a public health concern due to the major shortage of homebirth midwives. In addition, accessing homebirth midwives is doubly challenging for lower-income women because of Medicaid’s lowered reimbursement for midwife services. Ultimately, the panelists urged mothers-to-be to take control of the birthing process in a way that puts their safety first. **Click on gallery below to view pictures.